30 passenger, donation based transportation for active duty service members from Camp Pendleton to the Gas Lamp district, Pacific Beach and back. Running 6 days a week, the VET Van will provide a means of safe, alcohol free, affordable transportation to active duty service members, jobs to unemployed VFW/DAV service members and guidance to young service men and women. A portion of the proceeds from the VET Van will help fund the “Re-Entering Friendly Lines” program, which provides service members access and opportunities to quality mental health and substance abuse programs. 27% of veterans returning from Iraq or Afghanistan were found to be at high risk for harmful behaviors such as driving while under the influence of alcohol or drugs. An estimated 13.2 percent of veterans reported driving while under the influence of alcohol or illicit drugs in the past year compared to 12.2 percent of comparable non-veterans. The National Survey on Drug Use and Health (NSDUH) represents a unique source of epidemiological data on alcohol use by veterans. Alcohol misuse is associated with increased risk of injuries, motor vehicle crashes and loss of productivity as well as physical and mental health problems. The VETality Corp VET Van has a four part mission. First is to provide a safe and affordable alcohol free transportation service within the City of San Diego to active duty service members during times of liberty. Second is to provide guidance and leadership to young service members from DAV/VFW VET VAN drivers and operators. Third is to increase the employment opportunities for DAV/VFW members within our community. Lastly, a portion of the proceeds raised by the VETality Corp VET Van will be used to fund mental health and substance abuse treatment programs. The VET Van is a 30 passenger transportation bus that will travel from the Marine Corp Base, Camp Pendleton to the Downtown San Diego Gas Lamp District and the Pacific Beach area. The service is FREE and will rely on donations from passengers to maintain the service that the VET Van provides for the community. In addition, in an effort to reduce overhead and maximize donation potential, we will be converting our vans to use bio-diesel fuel. The VET Van will make three round trips to each location daily Monday – Thursday, and four round trips to each location on Friday and Saturday. 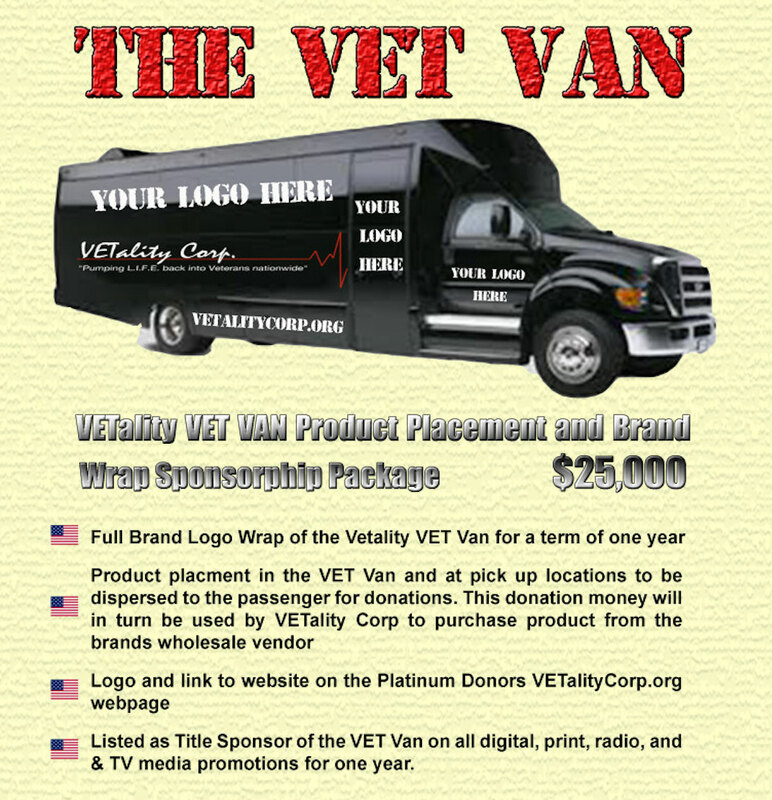 VETality corp will be hiring four to six DAV/VFW unemployed service members to drive and maintain the VET Van. This will serve a dual purpose by providing leadership, guidance and wisdom to young service men and women. Also, it will create new job opportunities for unemployed veterans within our community. A portion of the proceeds raised by the VETality Corp VET Van will be distributed to the “Re-Entering Friendly Lines” mental health and wellness program. Organized by VETality Corp Directors, this program is designed to provide access and opportunities to quality mental health and substance abuse treatment. VETality Corp will work with other non-profit and provide organizations to design easily accessible and affordable treatment for veterans in need. Contact us for more VET VAN info!